Bad Wildungen has a longstanding, international reputation as a classic spa town. Its picturesque location, surrounded by the heavily forested low mountain ranges of the Waldeck region, has made the town an increasingly popular destination for holidays and the pursuit of relaxation over the last few years. Bad Wildungen’s pretty townscape and many exciting events throughout the year mean that it is also very popular with day-trippers and tour parties. The town is situated around 300m above sea level in the foothills of the Kellerwald forest and some of the surrounding hills are over 600m high. The landscape is characterised by large, interlinked, mixed forests and extensive beech forests (National Park Kellerwald-Edersee). Over 500km of well-defined paths make the natural beauty of this area more accessible to walkers. The mild climate in the Edersee region’s fairytale landscape augments the relaxing conditions sought by holidaymakers and spa guests. The spacious, well-kept spa gardens are the showpieces for the traditional spa town of Wildungen and the modern health resort in Reinhardshausen. The European Union-funded ‘Forest and Health’ project and the former site of the Hessian Garden Show (2006) now serve as a ‘green bridge’ between the two resorts which now comprise the largest health resort in Europe. Bad Wildungen and Reinhardshausen represent a perfect combination of classical spa atmosphere, modern spa medicine and impressive cultural vibrancy. 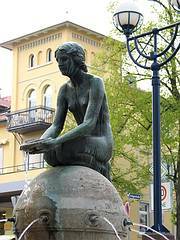 The historic Old Town makes Bad Wildungen stand out from all other spa resorts in Germany.